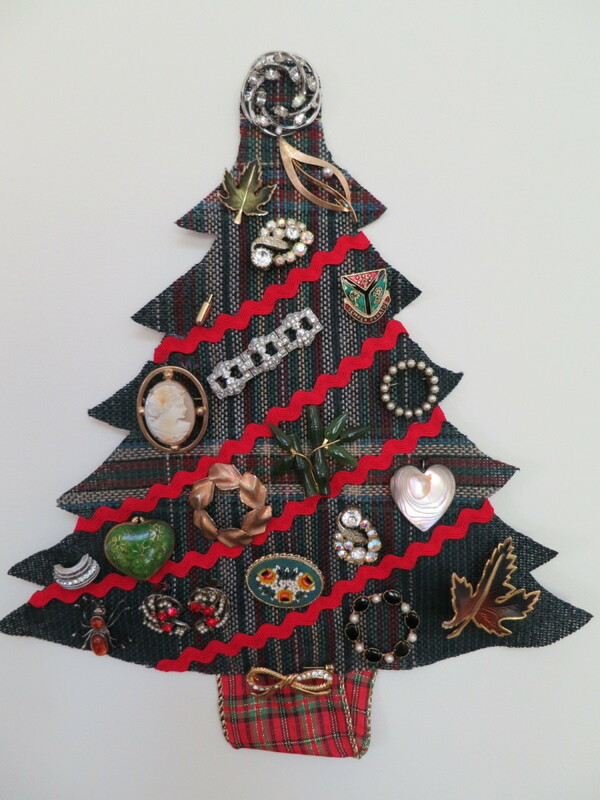 This handmade wall decoration will add a festive sparkle to your holiday décor, using your own vintage or costume jewelry as ornaments for this easy Christmas project. And the best part is that you don't have to ruin your jewelry to make it! Your jewelry can be removed and go straight back into your jewelry box to wear and enjoy again. My mother had a decoration similar to this that my aunt had made using her collection of costume jewelry. I loved all the different designs of jewelry that were on display. I always thought that this tree was a unique family heirloom. Then a few years ago, a co-worker displayed a wreath decorated with costume jewelry on her office door during the holidays. I guess my aunt's tree wasn't really a one-of-a-kind family treasure (though I still cherish it). I'm guessing that these wall hangings might have been a popular project in the 1950s or 60s. I think it's time we rediscover this sparkly holiday craft! 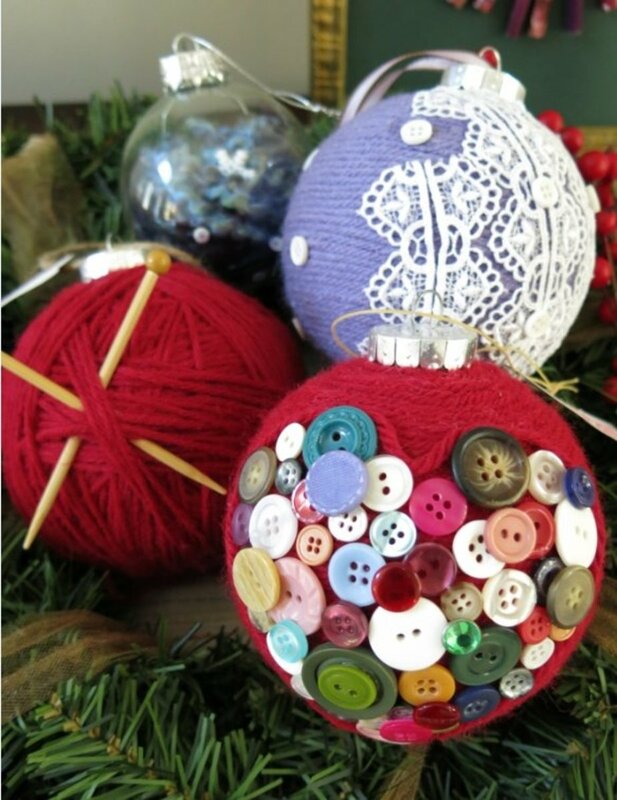 This Christmas project would be a great way to teach children basic sewing skills: Construct your decoration following the steps below, but instead of jewelry use buttons. The kids can pick out the buttons they want to use and place them wherever they want. Then, teach the children the basics of sewing on a button using a needle and thread. They don't need to be very particular about the position of each button, but the repetition of sewing on the buttons will make them experts in no time. Then they can display their finished decoration with pride! jewelry or buttons you wish to use - you can use brooches, pins, pendants removed from their chains, pierced earrings, clip on earrings, stick pins and even cuff links. You can also use fancy and shiny buttons as your decorations. 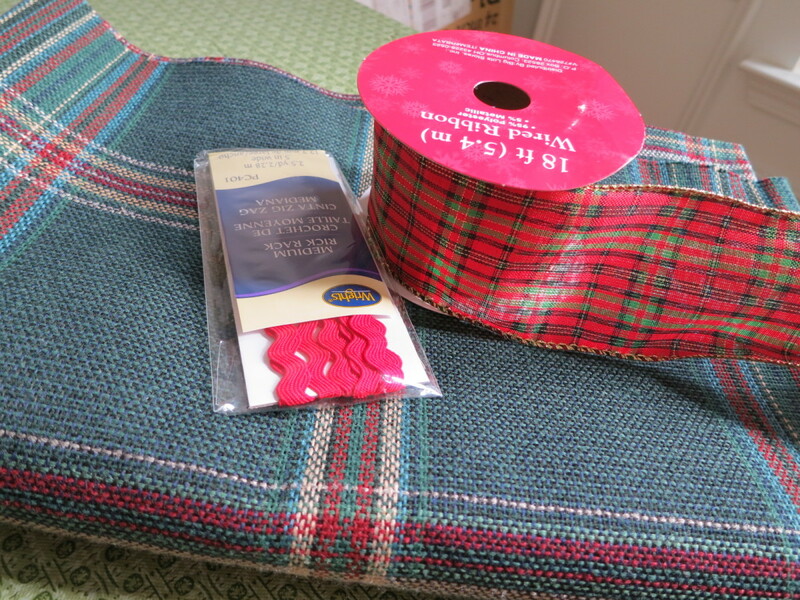 fabric - how much fabric you will need depends on how large you want to make your wall hanging. My tree is about 15 inches high by 8 inches wide. You can use felt, fleece, corduroy, upholstery fabric, or velvet as your material, just be sure to pick something that is heavy enough to hold the jewelry without drooping (you also want it to be soft enough to pin your jewelry through). 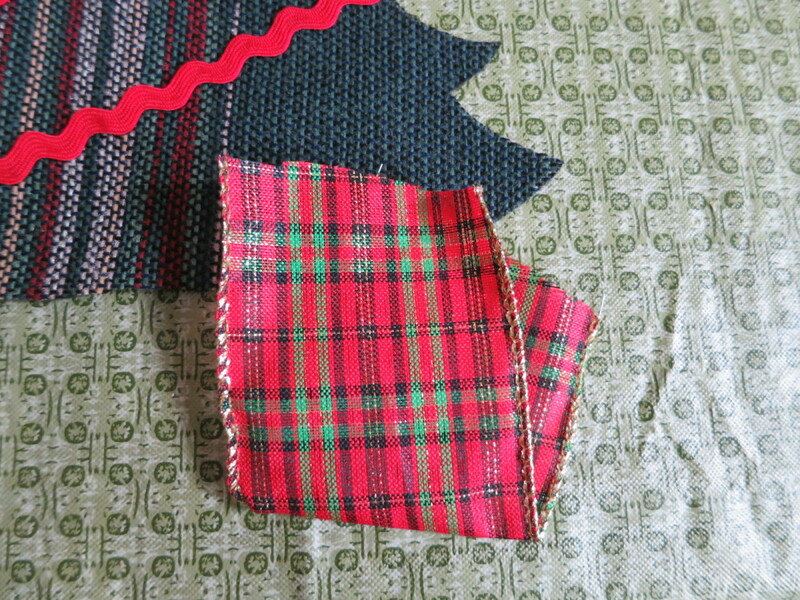 Felt and fleece are good choices because the fabric does not fray when cut. If you use something else, you may need to add a fabric stabilizer to the back to stop fraying. If you are unfamiliar with using stabilizers, I suggest you use felt or fleece. trimmings - optional, but you can using various trims to decorate your Christmas tree or wreath. Ric rack, ribbon, lace or crocheted edging, sequins, and beading are all great additions. You can also add more trim to fill in your design if you don't have enough jewelry or buttons that you want to use. 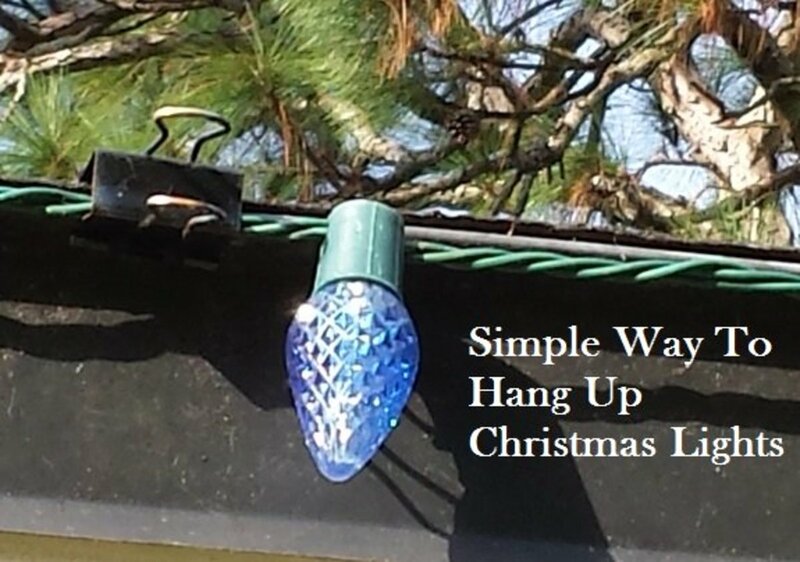 a ring or loop of fabric to use to hang your decoration - I used a wire key ring I had, but you could use a loop of your fabric or a plastic ring from a shade pull. needle and thread or fabric glue - I used fabric glue for most of my project, but used a needle to sew on my pendants and the ring for hanging. 1. 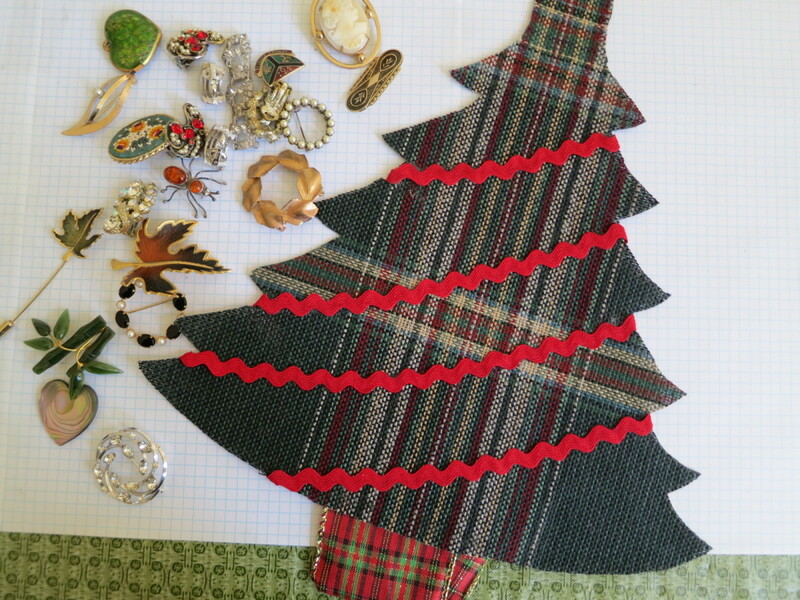 First, collect all the jewelry or buttons you want to use for your project. This will help determine the size of your wall hanging. Start by laying it out and arranging it in the shape you want for your decoration. 2. Find a template for the shape of your decoration. 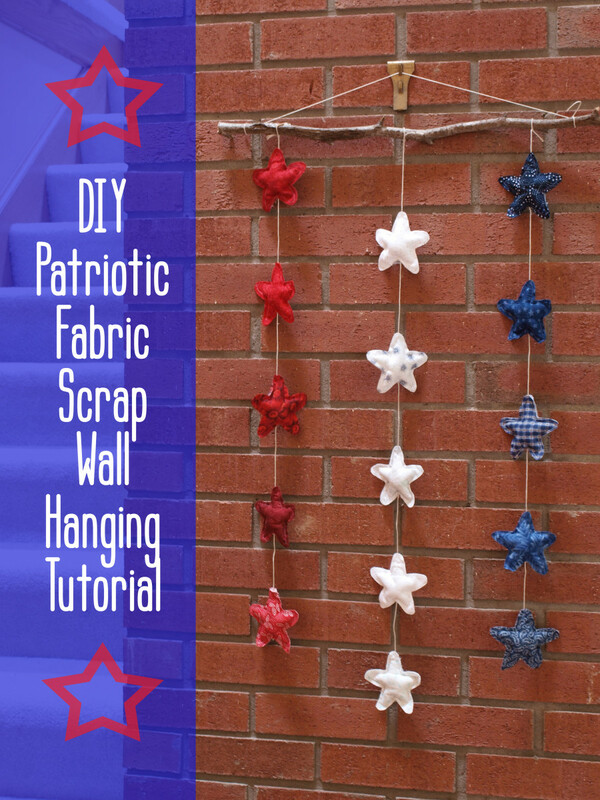 Your wall hanging can be shaped like a Christmas tree, wreath, star, or even a bell. Maybe there are other shapes to use? You can look on the internet for an image to use as a template. 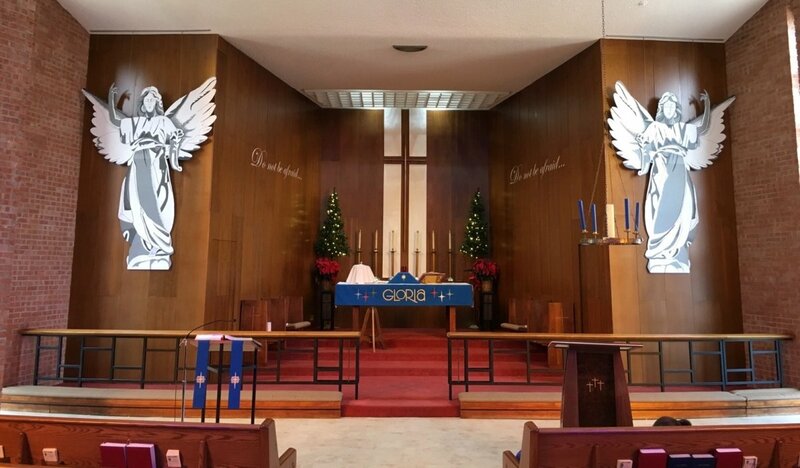 I searched for images under "Christmas tree outline." You can also use coloring books or pattern books to find an image. 3. Print out your image at the size you want for your wall hanging. Before you cut it out, take a marker and make any changes you want to your outline (make the base larger, add more leaves, etc). This is also a good time to sketch in the placement of your trim so you know where to put it. 4. Next, lay out your jewelry or buttons on your template and decide on their position. Your trim can act as guidelines. Once you have an arrangement you like, take a photo of it for reference for your finished piece. 5. Cut out your template and trace the image outline on to your fabric. I used a chalk pencil to trace my stencil on to the back of my fabric. Then cut out your shape using a good pair of scissors. 6. Start attaching your trim. I used fabric glue, but a sewing machine would probably be much faster. I made my trim pieces a little longer than what I needed, then folded the ends around the back of my tree and glued them in place too. Note: although the fabric glue will dry clear, you want to be neat about gluing your trim in place. Spots of glue will dry hard and will be difficult to work the jewelry posts or pins through. 7. Add any special touches to your fabric piece. You can make your shape out of however many fabrics you want, adding different colors and textures with different materials. 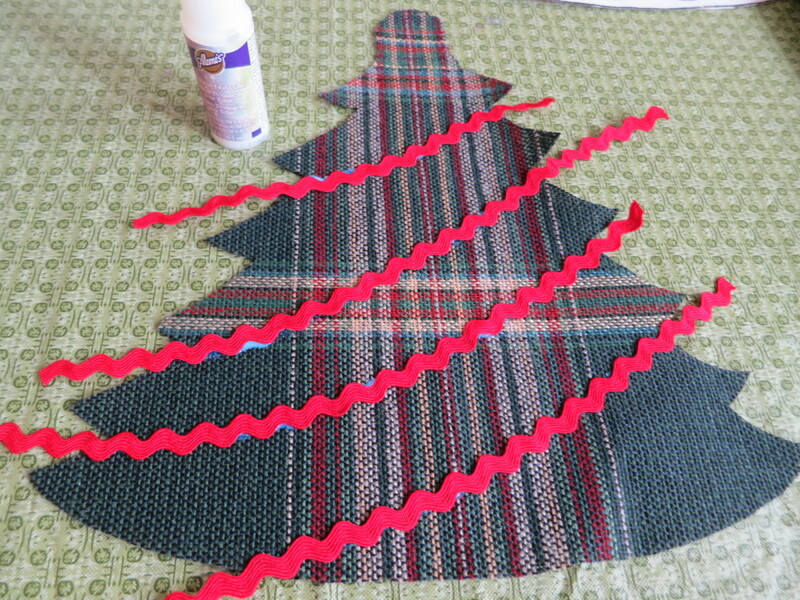 I made the base of my tree out of a thick ribbon because I liked how the two plaids looked together. I just cut a length of my ribbon, folded it into a V, and glued in onto my tree on the back side of the fabric. 8. Now the fun part - start attaching your jewelry or buttons. 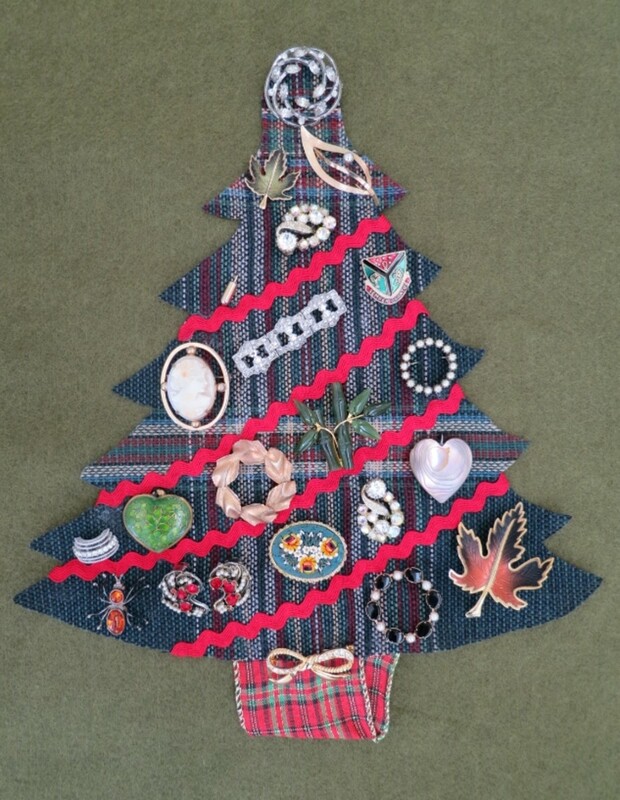 I used a variety of items for my tree as a sample. 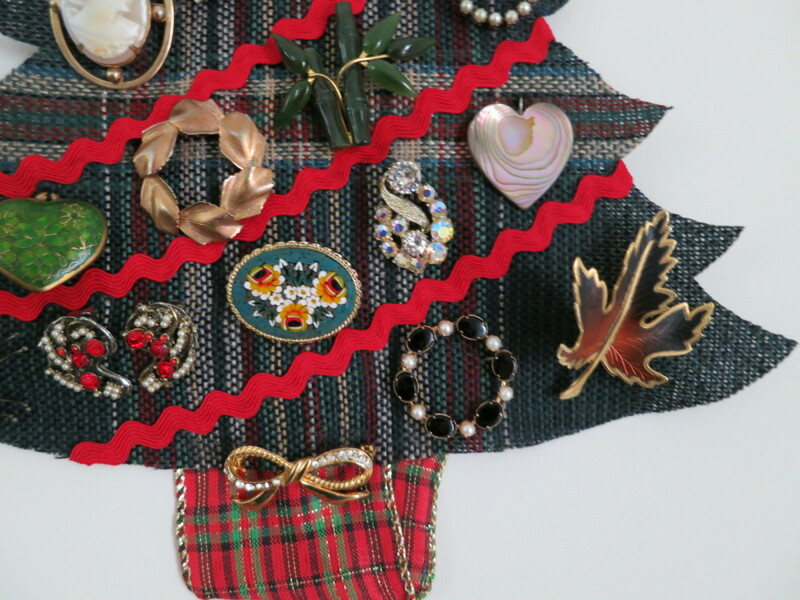 You can just stick pins, brooches, and pierced earrings through your fabric. I removed my pendants from their chains and sewed them on my decoration. For clip on earrings and cuff links, I cut a little slit in my fabric to push the back through, then clipped them in place. Referring to my photo from when I was laying out the jewelry on my template made this step much easier. I put a glitzy pin at the top of my tree in place of a star, and finished off my base with a little bow. It's fun to figure out the best place for each piece! 9. Lastly, sew your ring or hanging loop on your decoration. Hang it on the wall and enjoy! So what if you want to be able to wear the jewelry you used after the holidays? Before you take down your decorations, take some good photos of your piece. Then remove your jewelry. Tuck the photos in with your fabric wall hanging when you store it after the holidays. Next year, you will have a photo reference of how to put your jewelry back in place! Copyright © 2013 by Donna Herron. All rights reserved. Thanks, starstream! I'm glad you enjoyed this hub :) I appreciate your comments and thanks for stopping by!! I enjoyed reading your hub which is a fine idea with instructions for using vintage jewelry for home décor! I love finding vintage treasures and think this would be a fun project as well as a family heirloom. Thanks again, Joelle, for all this information! I'd definitely need to do some research and probably upgrade my camera to learn about the video part, but it's an interesting opportunity. Good luck! You are most welcome, Purl3Agony :-) I don't have videos on curious.com yet but they contacted me because they found my youtube channel. They asked me to send 2 videos (they chose them) and they will have a webinar to explain how to proceed to place the next videos myself. I have very special projects that I might want to tape to receive some revenue but it will not be in the near future. Thanks, Joelle! You're so sweet to think of me and pass on this information. I'll definitely check it out. It sounds very cool. Do you have video tutorials posted there? Thanks again for all your kind words and support! I hope you have a great week as well! Hi Suzanne - Thanks for your comments! I'm not sure I would have made this decoration if I would not be able to reclaim my jewelry and wear it again. I agree the best part is that this project is "recyclable". 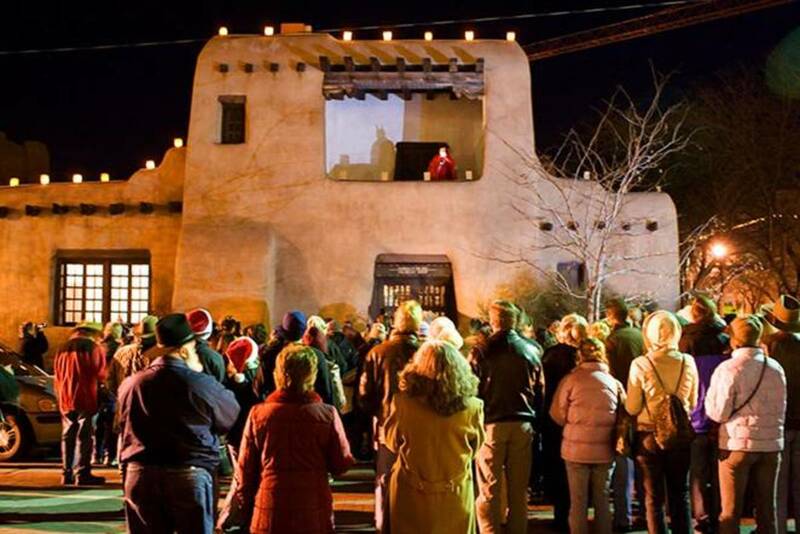 And next year, you could use different pieces as part of this project! Thanks, Erin, for stopping by and commenting! Interesting idea and it looks like it could be useful for Christmas jewelry you're wearing this year, too. Hi FlourishAnyway - Thanks so much! I appreciate your vote up and pin!! This is a great way to display so many of the vintage jewelry that doesn't often get worn. Voted up and pinning. Thanks for your pin and share!! What a great idea! 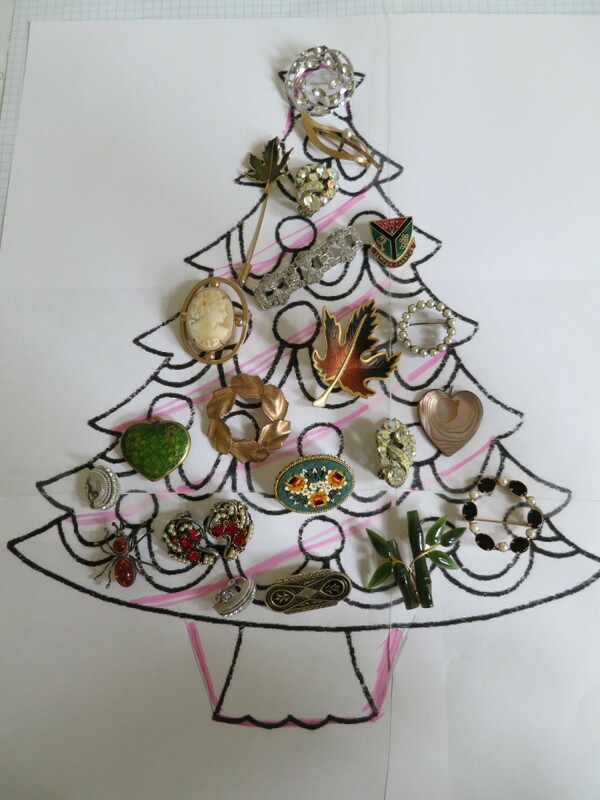 My aunt displays her jewelry throughout the year in a similar way but without the Ch-mas tree! This is a lovely holiday décor option. Sharing this one. Thanks so much, Gypsy48! I appreciate it!! Thais is so beautiful, very creative and unique. purl3agony, this is so beautiful. You always come up with the best projects. Can't wait to try it myself. Hi kidscrafts - So glad you like it! This project is also a fun opportunity to go through all the jewelry you might not wear often and look at it with fresh eyes. Some of these pieces bring back memories for me. A lot of them are family pieces or things I bought a *long* time ago. 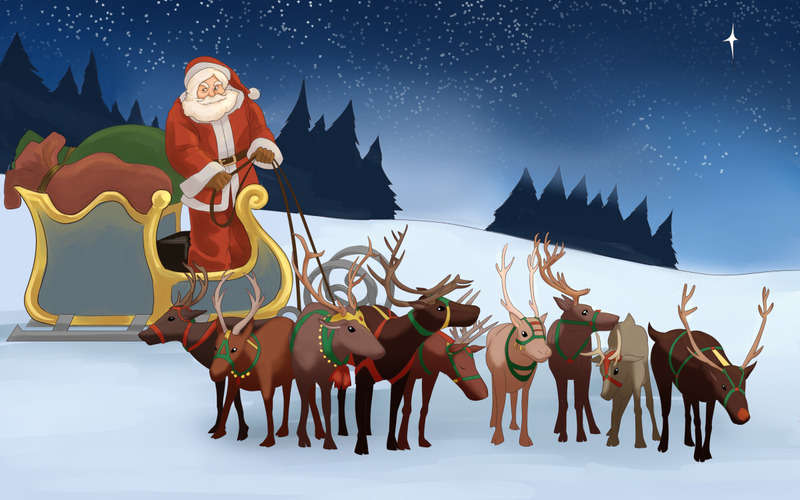 Thanks, as always, for stopping by and commenting! Have a great weekend!! Adorable! And you could make this with plenty of yard sale finds, too. Thanks for an interesting Hub.